In this article, we investigate the information-theoretical performance of a cooperative orthogonal frequency division multiplexing (OFDM) system with imperfect channel estimation. Assuming the deployment of training-aided channel estimators, we derive a lower bound on the achievable rate for the cooperative OFDM system with amplify-and-forward relaying over frequency-selective Rayleigh fading channels. The bound is later utilized to allocate power among the training and data transmission phases. Numerical results demonstrate that the proposed power allocation scheme brings between 5 and 19% improvement depending on the level of signal-to-noise ratio and relay locations. The online version of this article (doi: 10.1186/1687-1499-2012-372) contains supplementary material, which is available to authorized users. 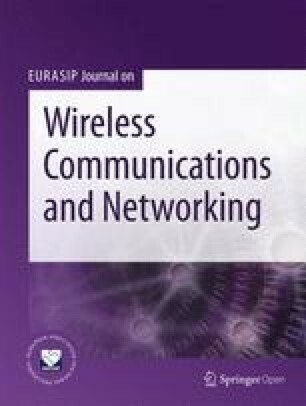 Cooperative transmission has been proposed as a powerful method to overcome the degrading effects of fading in wireless channels [1, 2, 3]. Exploiting the broadcasting nature of the wireless channel, cooperative transmission builds upon the idea of a number of nodes helping each other through relaying. It extracts spatial diversity advantages in a distributed manner and brings significant improvements in link reliability, spectral efficiency, and coverage area. Two popular relaying schemes are decode-and-forward (DF) and amplify-and-forward (AF), which are sometimes referred to as regenerative and non-regenerative relaying, respectively. In AF relaying, the relay node retransmits a scaled version of the received message without any attempt to decode it. In DF relaying, the relay node decodes the received message, re-encodes, and transmits to the destination. Information-theoretical aspects of cooperative communications have been investigated by several authors [4, 5, 6, 7, 8]. Gastpar and Vetterli  have examined the asymptotic capacity as the number of relay nodes goes to infinity. In their derivations, they have assumed arbitrarily complex network coding over Gaussian relay channels and ignored the effects of fading. Wong et al. have derived upper and lower bounds on the capacity for both deterministic (i.e., fixed channel coefficients) and Rayleigh fading channels. Optimum resource allocation has been proposed in [9, 10] to optimize the capacity of AF networks. Specifically, Maric and Yates  have investigated power and bandwidth allocations for a large number of relay nodes assuming that the channel state information is available at the transmitter. Deng and Haimovich  have developed power allocation strategies to optimize the outage performance for a single-relay AF cooperative system. Zheng and Gursoy  have derived achievable rates for AF and DF relaying with imperfect channel estimation. A common assumption in the aforementioned works is frequency-flat fading channel model. Although this model is sufficient to model narrowband systems, it becomes unrealistic for broadband communication systems where the transmission bandwidth is larger than the coherence bandwidth of the channel. This, in return, results in a frequency-selective channel, which causes intersymbol interference (ISI) at the receiver. A widely used approach to overcome the degrading effects of ISI is orthogonal frequency division multiplexing (OFDM). OFDM has already been adopted by various industry standards such as IEEE 802.11 (WiFi) and 802.16 (WiMax). Currently, there has been a growing interest in the application of OFDM to cooperative communication systems [12, 13, 14, 15, 16]. In , a space–time cooperative protocol with the transmitter and receiver architecture, frame structure, and synchronization algorithms are designed for an OFDM relay system. In , power loading is considered in the frequency and time domains to maximize an instantaneous rate, assuming channel knowledge is available at the transmitter. In , equalization methods for cooperative diversity schemes over frequency-selective channels have been investigated. Ma et al. have proposed a margin-adaptive bit and power loading approach for an OFDM single-relay system. 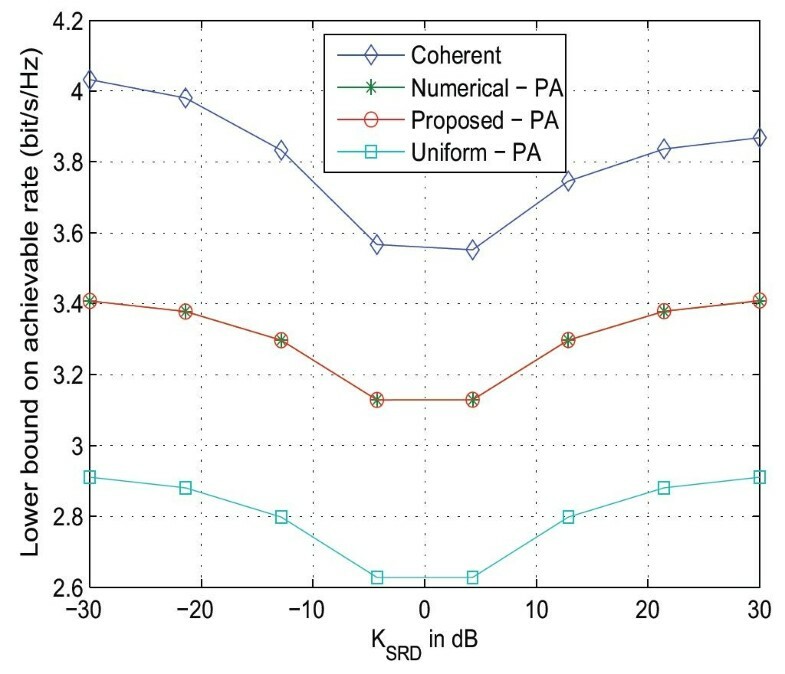 Ibrahimi and Liang  have investigated joint power allocation among the source, relays, and OFDM subchannels for coherent reception. These works are based on the assumption that perfect channel knowledge is available at the receiver and/or transmitter. In practice, the channel coefficients need to be estimated and made available to the receiver. Recent research efforts have focused on the analysis and design of OFDM relay systems with imperfect channel estimations. Amin and Uysal  have investigated bit and power loading for an AF OFDM relay systems using bit error rate as the performance measure. Wang et al. have considered the resource allocation and relay selection in a DF orthogonal frequency division multiple access-based downlink network. However, few of the current works address the achievable rates for an OFDM system with imperfect channel estimation. In this article, we study the achievable rate for a single-relay OFDM system with AF relaying and a training-aided channel estimator at the receivers. We assume no knowledge of channel state information at the transmitter side realizing an open-loop scheme. Minimum mean square error (MMSE) estimators are applied to obtain the channel estimates. In the derivation of the achievable rate of the OFDM relay system, the channel estimation errors are considered together with the noise forwarded from the relay node and noise at the destination. Since the statistical distributions of the channel estimation errors are difficult to characterize, a closed-form analytical expression for the achievable rate is mathematically intractable. We, therefore, resort to find a lower bound on the achievable rate. Then, we use this bound to allocate power between the training and data transmission phases. The rest of the article is organized as follows: Section 2 introduces the system model and describes the training and data transmission phases. In Section 2, we derive a lower bound on the achievable rate, assuming the distintegrated estimation of source-to-relay and relay-to-destination links. Section 2 presents a power allocation scheme by maximizing the derived bound. In Section 2, we investigate the problem of cascaded channel estimation for the overall relaying link. Numerical results are provided in Section 2. Finally, Section 2 concludes the article. Matrices and column vectors are denoted by uppercase and lowercase boldface characters, respectively (e.g., A, a). The transpose of A is denoted by AT, and the conjugate and transpose of A by AH. A vector s of length N is denoted by s=[s(1),s(2),…,s(N)]. I K denotes a K×K identity matrix and 0 stands for an all-zero matrix of appropriate dimensions. X(i,j)denotes the (i,j)th element in matrix X. The i th diagonal element in diagonal matrix D is denoted by D(i). E [ · ] Open image in new window is the expectation operator, and log(·) represents a logarithm of base 2. The notation n ∼ C N ( 0 , Σ ) Open image in new window means that n is a circularly symmetric complex Gaussian (CSCG) random vector with zero mean and covariance matrix Σ. Matrix VAB denotes a Q×LAB matrix whose (k,m)th element is given by VAB(k,m)=exp(−j 2Π(k−1)(m−1)/Q), 1≤k≤Q, 1≤m≤LAB. A three-node cooperative system is illustrated in Figure 1. The relay node R assists transmission from the source node S to the destination D. Each node is equipped with a single antenna and operates in a half-duplex mode. The transmissions and receptions are not carried out simultaneously. An orthogonal AF relaying strategy is applied, whereby the source node first transmits to the destination and the relay node (broadcasting phase), and then the relay node forwards a scaled noisy version of the signal received and the source node is silent (relaying phase). The underlying channels are modeled as frequency-selective Rayleigh fading with a uniform delay profile. To overcome the ISI in frequency-selective channels, we apply the OFDM scheme to the relay system, which converts the frequency-selective fading channel into a number of parallel frequency-flat channels free of ISI. An aggregate channel model consisting of both long-term path loss and short-term fading effects is considered. The path loss is proportional to d−γ, where d is the propagation distance and γ is the path loss exponent. By normalizing the path loss in the source-to-destination (S→D) link to be unity, the relative gains from source-to-relay (S→R), and from the relay-to-destination (R→D) links are defined, respectively, as KSR=(dSD/dSR) γ and KRD=(dSD/dRD) γ . The channel impulse responses (CIRs) for S →R, R → D, and S → D links are given, respectively, by hSR = [hSR (1), hSR (2), …, hSR (LSR)], hRD = [hRD (1), hRD (2),…,hRD (LRD)], and hSD = [hSD (1), hSD (2),…,hSD (LSD)]. The entries in hSR,hRD, and hSDare independent identically distributed (i.i.d) zero-mean CSCG random variables with variances of 1/LSR, 1/LRD, and 1/LSD, respectively. The underlying channels are modeled as quasi-static Rayleigh fading, whereas the CIRs remain constant in the duration of one OFDM block and change to independent values that hold for another block. To avoid the inter-block interference for the OFDM system, a cyclic prefix of length max(LSD,LSR,LRD)−1 is applied. After the cyclic prefix is removed at the receivers, the length of the OFDM block is denoted by Q (which is also the number of subcarriers in one OFDM block). We assume that both relay and destination nodes are equipped with channel estimators. The relay node obtains an estimate of the CIR from the S → R link through training symbols and feed-forwards this information to the destination. The relay node also transmits “clean” training symbols so that the CIR for the R →D link can be obtained at the destination.a In , it is proven that the minimum length of training symbols required for a non-cooperative OFDM system equals the channel length, and the optimal placement is that the training symbols are periodically inserted in each OFDM block. In this article, we adopt a similar channel training strategy. The number of training symbols is chosen as the maximum channel length among the links, i.e., N=max(LSD,LSR,LRD), where N is the number of training symbols. The number of subcarriers in an OFDM block is chosen as Q=(M + 1)N, with M≥1being an integer. The training symbols are placed periodically at positions i ℓ =1 + (ℓ−1)(M + 1),ℓ=1,…,N in the OFDM block. Let the vectors xS=[xS(1),xS(2),…,xS(N)] T and x R =[x R (1),x R (2),…,x R (N)] T denote, respectively, the training symbols transmitted from the source and relay nodes. The data symbols are collected in vector y=[y(1),y(2),…,y(MN)] T . With the training symbols periodically inserted, an OFDM block transmitted from the source node is expressed as [xS(1),y(1),y(2),…,y(M),xS(2),y(M + 1),…,y(2M),…,xS(N),y((N−1)M + 1)…,y(MN)]. Let PS and P R denote, respectively, the available power at the source and relay nodes. Assuming that the training symbols are independent of the data symbols, we define P S = 1 ( M + 1 ) N ( x S H x S + E [ y H y ] ) Open image in new window , and P R = 1 ( M + 1 ) N ( x R H x R + E [ w R H w R ] ) Open image in new window , where w R H Open image in new window is the signal vector forwarded from the relay node. The power allocated in training and data transmission phases at the source and relay nodes can individually be written as x S H x S / N = α t P S , E [ y H y ] / ( MN ) = α d P S , x R H x R / N = β t P R Open image in new window , and E [ w R H w R ] / ( MN ) = β d P R Open image in new window , where αt,αd,βt, and βd are, respectively, the power allocation factors deployed at the source and the relay node, and they are related by αt + M αd=M + 1 and βt + M βd=M + 1. So far, we have assumed that both relay and destination nodes are equipped with channel estimators and the channel estimates in S→R and R→D links are obtained, respectively, by the training symbols sent at the source and the relay nodes. In this section, we assume that only the destination is equipped with a channel estimator. Therefore, it is the duty of the destination to obtain an estimate of the overall relaying S→R→D link using the training symbols sent from the source. In describing this alternative scheme, we try to use the same variables, whenever possible, as in prior sections, or we use ( · ) ̌ Open image in new window whenever necessary. Inserting the training symbols periodically (similar placement as in prior discussion), the OFDM block transmitted at the source node is written as d = x S ( 1 ) , y ( 1 ) , y ( 2 ) , … , y ( M ) , x S ( 2 ) , y ( M + 1 ) , … , y ( 2 M ) , … , x S ( N ) , y ( Ň − 1 ) M + 1 , … , y ( MŇ ) Open image in new window , where x S ( i ) , i = 1 , … , Ň Open image in new window are the training symbols. The power constraint at the source is P S = 1 ( M + 1 ) Ň ( x S H x S + E [ y H y ] ) Open image in new window , x S H x S / Ň = α t P S , E [ y H y ] / ( MŇ ) = α d P S Open image in new window . To remove inter-block interference, a cyclic prefix is added at the beginning of the transmitted vectors at the source node. Let dwcpdenote the transmitted vector with cyclic prefix, the length of which is Q ̌ + L cp Open image in new window , where Q ̌ = ( M + 1 ) Ň Open image in new window is the total length of training symbols and data information (length of vector D), Lcp is the length of the cyclic prefix, and “wcp” stands for “with cyclic prefix.” The received signal at the relay can be expressed as K SR h SR ⊗ d wcp Open image in new window , in addition to the noise at relay, where ⊗denotes the operation of convolution. Scaling the received signal by factor A ̌ = P r ( Q ̌ + L cp ) K SR ( Ň α t + MŇ α d ) P S + σ 2 Open image in new window , the relay forwards the signal to the destination. The received signal at the destination is, therefore, A ̌ K SR K RD h RD ⊗ h SR ⊗ d wcp Open image in new window and subject to the noise forwarded by the relay and noise at the destination. There seems no analytical solutions to the power allocation factors αt and αd to maximize (36). The solutions can be obtained by maximizing the bound numerically. The proposed power allocation (Proposed-PA) strategy, with the values of α ̆ t Open image in new window and β ̆ t Open image in new window given, respectively, in (28) and (29). Uniform power allocation (Uniform-PA) with αt=βt=1. Numerical power allocation (Numerical-PA), with the values of αtand βtobtained by a numerically exhaustive search to maximize the lower bound on the training-based achievable rate in (23). where a ratio (M + 1)/M is applied, because it is not necessary for the genie-aided coherent relay system to allocate power to the channel training. 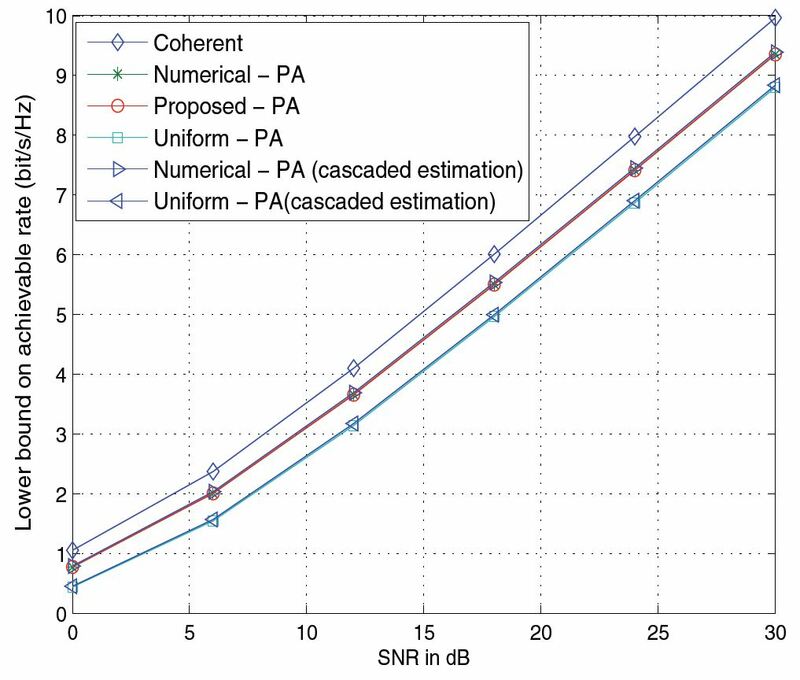 From Figure 2, we observe that the SNR gap between the Uniform-PA and coherent case is about 2.8–3 dB, and the achievable rate of the coherent transmission is 0.7–1.1 bits/s/Hz or 12–37% higher than that of the Uniform-PA. The Numerical-PA scheme reduces the gap by about 1.6 dB and provides 0.3–0.6 bits/s/Hz or 5–16% improvement for the bound on the achievable rate over the Uniform-PA scheme. It is also observed that the performance of the Proposed-PA scheme is almost identical to that of the Numerical-PA scheme. Comparison of Numerical-PA, Proposed-PA, and Uniform-PA schemes ( Q=164 ). To demonstrate the performance in the case of cascaded channel estimation described in Section 2, we obtain the power allocation factors by numerically maximizing the bound derived in (36) and plot the maximized bound. 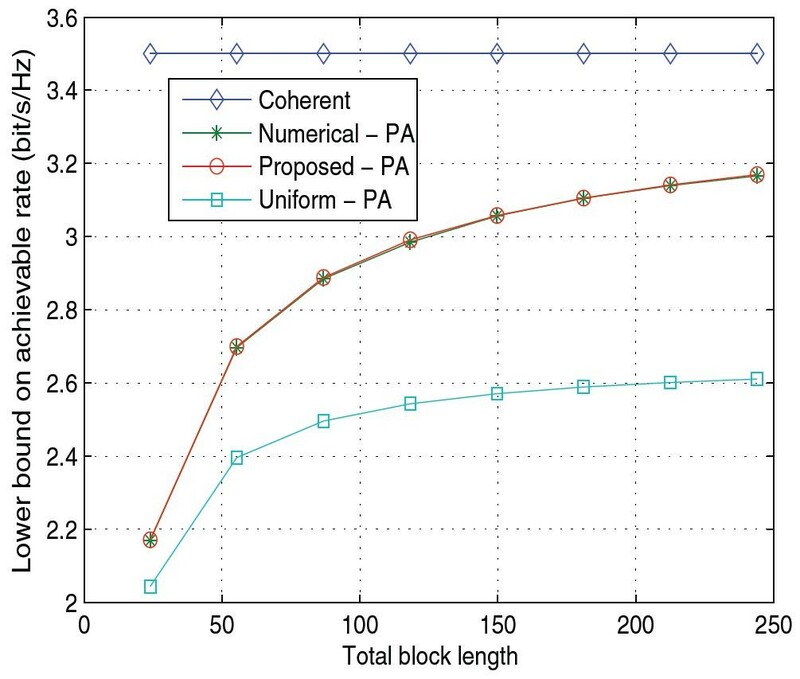 As shown in Figure 2, the curve is marked by “Proposed-PA (cascaded estimation).” In this case, the number of training symbols is N=max(LSD,LSR + LRD)−1=5, and the OFDM block length is chosen as 205. The bound in (36) with uniform power allocation α t =1 is also included, marked by “Uniform-PA (cascaded estimation).” It can been observed that, with appropriate power allocation factors, the lower bounds on the achievable rates remain almost the same, regardless of whether the channel gains in the relaying link are estimated as two separate channels or as one overall channel. In the following, we demonstrate the impact of some practical parameters such as OFDM block length, relay location, and channel lengths on the bound of the achievable rate. 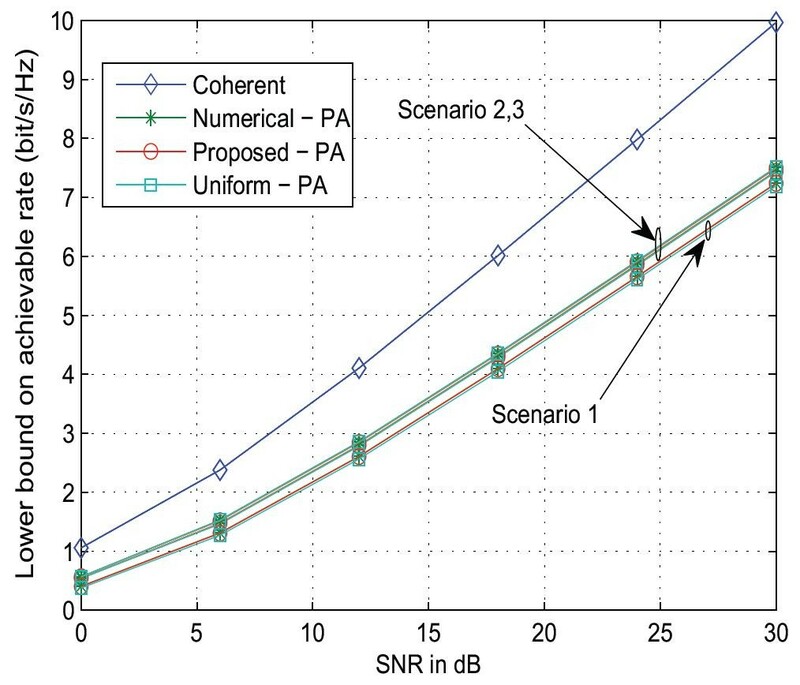 In Figure 3, we investigate how the length of OFDM block impacts the derived bound on the achievable rate for SNR = 10 dB. Plots indicate that the Proposed-PA and Numerical-PA schemes are consistently better than the Uniform-PA scheme regardless of the block lengths. 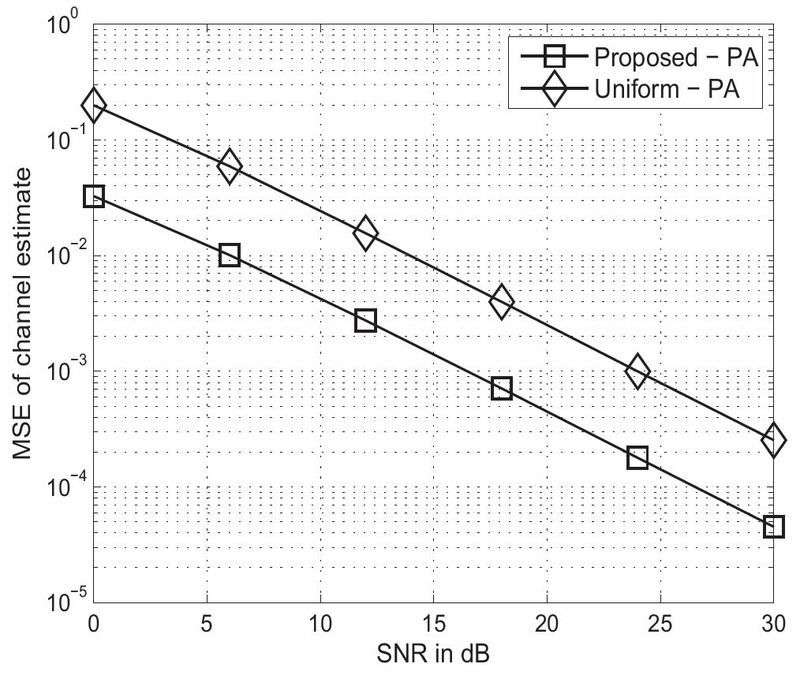 Effect of block length on the bound of achievable rate (SNR =10 dB). In Figure 4, we investigate the effect of relay location on the derived bound. The level of SNR is fixed at 10 dB. The ratio KSRD=KSR/KRD (in dB) is introduced to reflect the relative relay locations. The more negative this ratio in dB, the closer the relay is placed to the destination. On the other hand, positive dB values of this ratio indicate that the relay node is closer to the source. The plots in Figure 4 suggest that the cooperative system achieves higher lower bounds when the relay is close to the destination. The Proposed-PA scheme can provide an improvement of 17–19% on the bound, in comparison to that of the Uniform-PA scheme depending on the relay location. Effect of relay location on the bound of achievable rate. Bound on achievable rate for different channel length combinations. For these channel configurations, the number of pilot symbols increased to N=max(LRD,LRD,LRD)=30. We choose the block length Q=30(M + 1)=150with M=4, and SNR =10 dB. It can be observed that the system achieves almost the same bounds for Scenarios 2 and 3, and a little less for Scenario 1. These can be explained through the values of B1 and B2. One can observe from (24) and (25) that B1and B2 capture, respectively, the equivalent SNR in the direct link and in the relaying link with imperfect channel gains. In Scenarios 2 and 3, B1 and B2 yield identical values, resulting in a similar performance for the mutual information. On the other hand, for Scenario 1, the value ofB1 drops by 89% while B2 increases by 32%. The larger drop in B1results in a little more decrease of the bound in Scenario 1. To illustrate the performance of the Proposed-PA scheme on channel estimates, we examine the mean square error (MSE) in the channel estimate with and without power allocations. Figure 6 plots the MSE of channel estimate for the S→D link using the Proposed-PA and Uniform-PA schemes. The number of training symbols is N=4, and the OFDM block length is Q=164. Plots indicate that the Proposed-PA scheme provides about 7 dB SNR gain over the Uniform-PA scheme. Smaller errors in the channel estimate help improve the training-based achievable rates for the Proposed-PA scheme. In this article, we have investigated the achievable rates for a single-relay OFDM system with imperfect channel estimation. We first obtained a lower bound on the achievable rate and then used this bound to optimally allocate power between the training and data transmission phases. Since the optimum solution does not yield a closed-form expression, we proposed a suboptimal scheme by sequentially maximizing the terms in the integrand of the lower bound. Monte Carlo simulations demonstrate that the proposed power allocation scheme brings improvements of 5–19% depending on the SNR and relay locations in the bound on achievable rate, depending on the relay location and level of SNR. a In Section 2, we will further consider an alternative scheme in which only the destination is equipped with a channel estimator and therefore the overall cascaded channel is estimated.